On Christmas eve, Casey Mulligan claimed that the employment decline was due to an inward shift of the labor supply curve to which we noted that he had yet to give us his explanation for WHY the labor supply curve shifted inwards. Though ubiquitous these days, mortgage modification programs create terrible work incentives. This is one reason the current recession is so different from previous ones … Because of the low resale values, foreclosing on any of the homes will not yield lenders their entire principal; lenders in those cases must rely on the good behavior of the borrowers … these “modification programs” encourage lenders to reduce mortgage payments so that each borrower’s housing payments (including principal, interest, taxes and insurance) are 38 percent of the borrower’s gross income. The payments are to be reduced for five years, or when the mortgage is paid off (whichever comes first) ... I do not expect every adult among those in the 12 million underwater households to be without a job because of the modification rules. Mulligan is essentially saying that those poor saps who have lost their jobs actually quit so they can game the mortgage system. In other words, there is no such thing as involuntary unemployment or being forced to either lose one’s home versus enter into one of these mortgage modification programs. I’m sorry – but Casey Mulligan is clearly writing from some ivory tower and needs to get out into the real world. Olivier Blanchard, the IMF's chief economist, said "the size corresponds roughly to what we think is needed." He backed the Obama approach of targeted tax cuts, saying the money should go to consumers who are "truly credit constrained." In an accompanying research paper, Mr. Blanchard and three other IMF economists advised against broad cuts in corporate tax rates, dividends and capital gains -- Republican favorites -- which they judge "likely to be ineffective" because profits are low. The changes "are often difficult to reverse," they added. In an interview, Mr. Blanchard said a general tax cut may be less effective than other measures because many consumers would save the money. If we choose to go the fiscal stimulus route – shouldn’t we be interested in getting some real bang for the buck? I’m glad to see that Olivier Blanchard thinks so! In recent days Paul Krugman has been flailing a model of the term structure of interest rates and the liquidity trap based on the idea that there is an absolute lower bound of zero percent for nominal interest rates. This may have been true in the distant past, but it is not true anymore. We have seen numerous episodes of negative interest rates, with several outbreaks in the last few months, including on the actual federal funds rate and on 90 US Treasury bills, as well as on Japanese interbank rates in the late 1990s, when their target rate was at 0%. A not widely known episode that went on off and on between August and November of 2003 was in the repo market, which used to be used by the Fed for open market operations, as reported in a New York Fed study from April 2004 by Fleming and Garbade, accessible at http://www.newyorkfed.org/research/current-issues/ci10-5.html. It has only been convention and a left over belief like the old religious view that negative numbers did not exist that has led so many economists and others to think that zero is some absolute lower bound on interest rates. We may well see that bound breached more seriously and frequently in the months ahead, if the economic crisis continues to deepen. The prejudice against believing in negative interest rates, sometimes viewed as the "price of time," is not unrelated to the long-held opposition to the idea of negative prices. We see them regularly in real life, but they often get assumed away by defining paying for the removal of something (such as excess water) as a different market with a positive price from providing the same good when we want more of it (water for irrigation), even when the same activity does both things (building a dam with an irrigation system). Negative real estate prices often are associated with environmental problems, such as kaput coal mines leaking toxic waste that the owner is responsible for paying the cleanup of. In some countries, brides have a positive price while in some grooms do, although as Michael Perelman recently reported, Herodotus tells us of bride auctions in ancient Babylon where some are sold for positive and some for negative prices in the same auction. The great efforts by the general equilibrium theorists to avoid negative prices (not a problem for Walras) were a waste of time, as were all the huffings about negative surplus value in the Sraffian debates. Time to get over it, especially if we start seeing widespread negative interest rates. If the new spending is for projects that are beneficial for society overall, and if the private sector cannot or will not undertake these projects, then the expenditure is worthwhile independent of what it does to fight the recession. A standard example might be repair of the interstate highway system ... Even if certain components of the nation's spending are too low, nothing guarantees that new spending will be directed to these areas. Instead, experience suggests that much will be for repairing "bridges to nowhere," especially those located in the districts of influential legislators. The Keynesian argument for a spending stimulus does not, of course, assume this spending is for projects that have economic or social value. The theory, in fact, suggests that digging ditches and then filling them up is effective at stimulating the economy. This cannot make sense in the long run; government spending must be paid for with taxes, so it ultimately comes at the expense of private spending. Projects that do not make economic sense are then pure waste. Yet the history of government spending indicates the stimulus package will include countless zoos, aquariums, museums, parks and other pork barrel projects for which the private demand does not come close to justifying the investment. In many cases, these projects will persist for decades. If Jeffrey Miron is worried that the new Administration is about to push for a bunch of pork barrel projects, maybe he should talk to Lawrence Summers. So let me address instead Miron’s faith in tax cuts as the cure for our lack of aggregate demand. For those who advocate smaller government, the case for a tax cut is easier; short-run increases in the deficit are not a major concern if government should be smaller (and can eventually be reduced in size) in the long run. If the level of spending is too high, the U.S. can have its cake and eat it too: cut taxes now to improve efficiency and stimulate the economy and cut spending later to balance the budget. Of course, this smaller government canard was a rational for the 1981 tax cut and almost every Republican call for tax cuts since. But even when the Republican Party dominated fiscal policy decision making, we never saw any significant reduction in the size of the government. In other words, the plan is to give tax cuts to those who may indeed be facing borrowing constraints. I guess Miron might complain that President Obama intends to make these middle class tax cuts permanent by increasing taxes on the wealthy – who likely do not face borrowing constraints. But the redistribution of the tax burden is not likely to have much of a net effect on aggregate demand. Simply put – I do not see how Miron’s call for tax cuts will have as much bang for the buck in terms of accelerating aggregate demand as the set of fiscal proposals being advanced by the President-elect’s economic team. But this recession, it is the profligate United States pulling down fiscally disciplined Mexico. Like a host of middle-class countries, from South Africa to Brazil, Mexico is credited by economists with prudent economic policies that reduced debt and tamed inflation, but that has not saved any of them from the pain of a global recession ... When the American economy began to spiral downward, officials here argued that Mexico’s hard-won macroeconomic stability would protect it ... Now, as each week brings more bad news from the United States, those forecasts seem quaintly optimistic. The North American Free Trade Agreement, or Nafta, which so tightly bound Mexico and the United States and turns 15 on Thursday, is helping drag Mexico down with the United States just as it helped bolster it when times were good north of the border. When the American economy was growing, successive governments here counted on foreign investment and exports to generate growth. Exports account for almost a third of Mexico’s gross domestic product. But more than 80 percent of them go to the United States, and when American consumers stop buying, there is no market for Mexican-made big-screen televisions, auto parts or expensive winter fruit. Well – at least she introduced the open economy aspects. With the peso hovering around 10 pesos per dollar until August 1 of this year (since then it has devalued by about 33 percent), fiscal stimulus in the U.S. led us to import more goods from Mexico which should boost Mexican aggregate demand. As an aside, Dean Baker is not been that impressed with Mexico’s real GDP growth. Malkin goes onto note that the fall in U.S. aggregate demand has led to a fall in Mexican exports with a concern that Mexico that will also suffer a recession. If that is the case, fiscal restraint is precisely the wrong policy to adopt at this time. Update: I checked with this source to see if it is true that US imports from Mexico have declined. 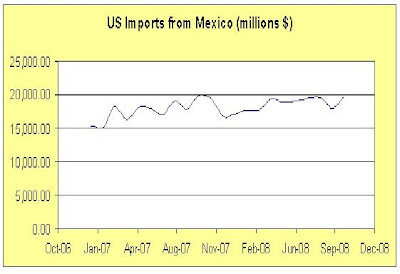 Our graph shows these imports from January 2007 to October 2008. Maybe economists are forecasting a decline but we had not seen it as of a couple of months ago. 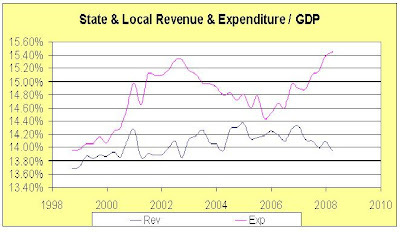 There has been much justified concern and talk about the fiscal problems of the state and local governments in the current crisis, most of whom have some form of balanced budget rule in place, forcing them to engage in automatic destabilizing policy in the form of cutting spending or raising tax rates as the recession lowers tax revenues. One of the most significant of rising costs that is hitting all the state governments, and has been even when times have been better, has been Medicaid, the needs-based program to pay for the medical care of poorer people. Unlike non-needs based Medicare and Social Security, this program is partly funded by the states as well as the federal government, which also means that poorer states face a larger burden. Although I have heard nobody propose this, and it would cost a lot of money at the federal level, there is an obvious move here that would help in both the short term and the longer term. Federalize Medicaid! Besides essentially eliminating the fiscal crises of the states, it would also provide a more level playing field in the longer term between the states. Do High Income Individuals Have a Lower Marginal Propensity to Consume or a Higher Propensity to Import? One way or another, there's really no way for the economy to grow strongly and consistently unless middle-class consumers spend more, and they can't spend more unless they make more … The only sustainable source of consistent growth is rising median wages. The rich just don't spend enough all by themselves. Kevin seems to be arguing that as income distribution gets more tilted from the poor and middle class towards the rich, consumption as a share of national income will fall. OK, we are currently concerned about an insufficiency of aggregate demand given that the sum of net investment and net exports is barely above zero. During the transitional (perhaps defined as a couple of years) Keynesian period of weak investment demand, we have the paradox of thrift where any upwards shift of the national savings schedule will only deepen the recession. But even the most die-hard Keynesians accept the Solow proposition that in the long-run, any increase in national savings will encourage more investment. And if Kevin is right about the rich having a lower propensity to consume – that is, a higher propensity to save – the old trickle down nonsense about taking from the poor to give to the rich would at least spur more investment demand and long-term growth. There’s no obvious reason why consumer demand can’t be sustained by the spending of the upper class — $200 dinners and luxury hotels create jobs, the same way that fast food dinners and Motel 6s do. In fact, the prosperity of New York City in the last decade — largely supported off of super-salaried Wall Street types — is a demonstration that you can have an economy sustained by the big spending of the few rather than the modest spending of large numbers of people. It is pretty easy to increase the multiplier; just raise import tariffs by enough so that the marginal propensity to import out of income is reduced substantially (to zero if you want the multiplier to go all the way to 2.8). Yes, yes, import protection is inefficient and not a very neighborly thing to do--but should we really care if the alternative is significantly lower growth and higher unemployment? More to the point, will Obama and his advisers care? Being the open economy that it is, I fear that the U.S. will have to confront this dilemma sooner or later. In an environment where the dollar has already appreciated against the Euro and even more significantly against emerging market currencies, fiscal stimulus here will produce an even larger current account deficit. If American consumers decide to spend 40 cents of a dollar of additional income on cheap imports from China and other foreign countries, the multiplier will be a mere 1.3. How long will it take before politicians of all stripes cry foul over the leakage through the trade account and the "gift to foreigners" that this represents? And they will have Keynesian logic on their side. Let’s postulate for a moment that the rich have a high marginal propensity to consume imported goods than do the poor. Even if redistributing income from the rich to the poor does not increase overall consumption (that is, we as a nation still save the same amount), it might induce less imports and more domestic spending. "Any cub productivity theorist can upset the idea by a mere reference to long-time effects on wages; but the unionists were blissfully ignorant of such theories..."
The quote is from Raymond Henry Mussey's "Eight-Hour Theory in the American Federation of Labor" (1927). 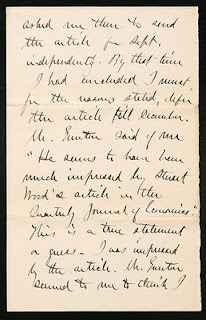 The image is a page from a letter from John Bates Clark to Franklin H. Giddings in which Clark explains the reason for the delay in publication of his productivity theory of wages. Science] Quarterly. This was then expected in Sept. I said let Mr. I was on my good friend's paper. I wonder just a little whether Mr.
George Gunton -- who formalized the American Federation of Labor's eight-hour philosophy in a 1889 pamphlet, "The Economic and Social Importance of the Eight-Hour Movement" (which was serialized on EconoSpeak a few months ago) -- was not "blissfully ignorant" of John Bates Clark's productivity theory of wages. On the contrary, Gunton was familiar enough with Clark's theory to write published critiques of it and to detect "impressions" in it of Wood's theory that Clark himself was not entirely aware of. Because productivity has been rising — almost as much as the Douglas formula predicts — the decreased employment is explained more by reductions in the supply of labor (the willingness of people to work) and less by the demand for labor (the number of workers that employers need to hire). Why would some people have fewer incentives to take a job in 2008 than they did in 2006 and 2007 (and employers fewer incentives to create jobs)? I will tackle that question in my next post, but even without a specific answer we learn a lot about today’s recession from the conclusion that labor supply – not labor demand – should be blamed. First of all, it suggests that a fundamental solution to the recession would encourage labor supply (perhaps cutting personal income tax rates, so people can keep more of their wages), rather than tinker with demand. Actually – Mulligan decides not to tell us what specifically induced people to reduce their offering of labor after all. The key item in his first post was referred to his next post? OK. But if there was some supply-side reason why workers decided to reduce their offerings of labor along an unchanged demand curve – wouldn’t that mean real wages would have gone up? Funny thing – Mulligan also fails to talk about this aspect of his bizarre explanation. I read that Marc Mukasey, son of Atty. Gen. Michael Mukasey, who works for Rudolph Giuliani's law firm, is representing Frank DiPascalli, whom the Wall Street Journal reports is suspected as being in the center of the Madoff scheme. Of course, Madoff himself and his family had numerous connections with regulators. Now just imagine that Madoff had been a poor person cheating on welfare. How long could he have gotten away with it? As President-elect Barack Obama and his economic advisers recognize, countering a deep economic recession requires an increase in government spending to offset the sharp decline in consumer outlays and business investment that is now under way. Without that rise in government spending, the economic downturn would be deeper and longer. Although tax cuts for individuals and businesses can help, government spending will have to do the heavy lifting. That's why the Obama team will propose a package of about $300 billion a year in additional federal government outlays and grants to states and local governments ... A temporary rise in DOD spending on supplies, equipment and manpower should be a significant part of that increase in overall government outlays. The same applies to the Department of Homeland Security, to the FBI, and to other parts of the national intelligence community. The increase in government spending needs to be a short-term surge with greater outlays in 2009 and 2010 but then tailing off sharply in 2011 when the economy should be almost back to its prerecession level of activity. Buying military supplies and equipment, including a variety of off-the-shelf dual use items, can easily fit this surge pattern. Feldstein’s call for some surge in government purchases with a scaling back when we reach full employment strikes me as good macroeconomics. However, we can do the same thing with public schools, bridges, and roads. Of course, I had a similar reaction to something Bill Kristol wrote. A human being is a part of the whole, called by us the 'Universe' - a part limited in time and space. He experiences himself, his thoughts and feelings, as something separated from the rest - a kind of optical delusion of his consciousness. This delusion is a kind of prison for us, restricting us to our personal desires and to affection for a few persons nearest to us. Our task must be to free ourselves by widening our circle of compassion to embrace all living creatures and the whole of Nature in its beauty. The Hubbard-Mayer Proposal to Nationalize Housing Finance – Can the Government Make Money on Socialism? One question is whether the loans will be sustainable. Hubbard and Mayer say that 1.9% is more than enough because the ordinary spread is 1.6%. But these are not ordinary times, and even if the plan does help turn around the economy, we are probably looking at 1-2 more years of rising unemployment and resulting defaults. Furthermore, conforming mortgages rates are already down to 5.2% (thanks in part to the Fed talking rates down), so Fannie and Freddie could face the problem of getting stuck with riskier mortgages while the private sector keeps the better ones. While this discussion does not answer the question, it does suggest that default risk today is higher that the historical spreads that Hubbard and Mayer are relying upon. Folded-in and The making of Balkan wars:The game at Monsters exhibition in Dresden. MONSTERS. Part II: Beat the Monsters! As the Sunni insurgency in Iraq gradually dies down, ethnic and religious conflicts tied to oil are becoming more central, as reported by Ben Lando at Iraqi Oil Report, http://www.iraqoilreport.com. The northern cities of Mosul, and especially Kirkuk, remain violent, flashpoints partly because the struggle between Kurds, Arabs, and Turkmen for control, also involves control of a major oil producing center, with the Kurdish Regional Government already cutting its own separate oil deals with outside companies. Lando also reports that there is a move on now in southern Basra to vote on attaining autonomy, which would allow that region, where most of the rest of the oil is, to cut its own deals separate from the central government. Meanwhile the collapse of oil prices means the central government will probably go from running a budget surplus this year to a deficit, with cutbacks in reconstruction spending, although having been so far down, Iraq may be in better shape than other oil exporters, such as Russia, who needs $70 per barrel to balance its budget (and has had its stock market drop by 80% this year), or even Saudi Arabia who needs the now-too-high $40 per barrel, same price the oil companies reputedly have used to make their long term production investments. Speaking of oil prices, this is an area where I was partly right, but did not go nearly far enough. So, in late spring, sometime after the price moved above $120 per barrel, I told a local TV station that it was looking like a speculative bubble, and the price could easily go down, "maybe even below $90 per barrel, although probably not below $70, and we will never see $2 per gallon for gas in the US again." Ooops! Wrong again. At least I recently talked a friend out of buying a six month forward contract on oil when it was at $53 per barrel, warning it could go as low as $25, which may yet also prove too high. But then, in 1930, at the beginning of the Great Depression, after the great East Texas oil field was discovered, the price fell in a six month period from about $1 per barrel to about 5 cents. A similar drop now would take it down to a bit over $7 per barrel from the peak of $147 in July, but then I am not expecting a find of an easy to pump oil field on the magnitude of the now largely depleted East Texas one. "We are not in a recession. We are not even in a depression. We are at the end of an era." -- Robert Paterson (by way of James Fallows). To commemorate finding $800 in an ATM yesterday, from May 2006: THE FUNDAMENTALS ARE SOUND by the Sandwichman. The story of a poor sandwich-man from Lithuania who found a fortune in a snow bank, went nuts and ended up back where he started, told entirely in headlines. as the Yen rises to a 8-month high against the Dollar. "plunged" 142 points on Thursday. The stock market will not crash on Friday! in a snow bank on Wall Street. Is Up to Surety Company. Wouldn’t Keep Real Money Either. Once Found $60 at Dance. Saw 'Sandwich” Man in Gale. Surety Concern to Give $275. Reports on New Job Today. More Gifts Are Sent in. President-elect Barack Obama and congressional Democrats have entered discussions over an economic stimulus package that could grow to include $850 billion in new spending and tax cuts over the next two years ... Obama is putting together a package of $670 billion to $770 billion but that he expects additions by Congress to jack up the total to about $850 billion, or 6 percent of the nation's economy. A package of that size - which would include at least $100 billion for cash-strapped state governments and more than $350 billion for investments in infrastructure, alternative energy and other priorities - is a significant increase over the numbers previously contemplated by Democrats. It would exceed the $700 billion bailout of the U.S. financial system, as well as the annual budget for the Pentagon ... Furman and Schiliro said the package would include $100 billion to help states cover the expanding cost of Medicaid, the federal health program for the poor. With more than half of states reporting budget shortfalls this year, the package also could include big increases in state block grants and other programs intended to help local governments avoid layoffs or tax increases. Uh oh – I have to nitpick again. First of all, it is true that defense spending is running at something near $700 billion per year so how is $850 billion over two years a larger figure? And if the extra cost of Medicaid eats up all of the $100 billion devoted to “cash-strapped state governments”, then what is left over to address what we discussed here? Maybe Ms. Montgomery needs more than a new calculator. Maybe she needs a better editor. Minus the amazement about the money multiplier, this proposal published in Yes! Magazine bears a superficial resemblance to mine. The big difference, of course, is that Brown would have the good citizens assume responsibility for all the liabilities of the banking system she would seize. This is why I have argued against bank nationalization and for new public institutions to take their place. A minor note: Germany is a somewhat more substantial instance of public banking than North Dakota. Not that I have anything against North Dakota. In fact, we’re having their weather right now in the Pacific Northwest. Times are tough. But not so tough that some people won't go and withdraw 800 bucks from an ATM machine and then forget to take the money (and the withdrawal slip)! Of course I did the right thing and turned the money over to the credit union where the bank machine was. Coincidentally, there was a story in the New York Times in the 1930s about a sandwich man who found $45,000 in securities in a snow bank on Wall Street. I did a post on that story on MaxSpeak. I'll have to see if I can dig it up again. It is being widely noted that the latest Fed interest rate cut pretty much uses up that tool for stimulating the economy, even though zero is a floor only in convention, and we have seen negative interest rates in fact. But there is more going on here than has been remarked on. To a substantial degree the latest Fed move involves covering up how seriously it has lost its ability to control the federal funds rate, its supposed main policy tool. The latest cut to 0-.25% simply moves the target down to where the actual ffr has been in recent weeks, well below the previous target of 1%. The deeper problem is that the recent turmoil and decline of interest rates to near zero is collapsing the repo market. This point was made on Dec. 16 in "Ultra-low US rates undermine repo market" by Michael Mackenzie, also linked to on marginal revolution by Tyler Cowen. MacKenzie stresses the general problems for liquidity in financial markets arising from this collapse, but did not note the rarely made point that this has been the market where the Fed has generally carried out its open market operations that control the ffr. So, the collapse of this market may well be why the Fed has been unable to control the ffr, which fact they may now be trying to cover up. MacKenzie notes that a major problem in the repo market is that people borrowing securities from dealers are not returning them on time, leading to "failed trades." Also, the low rates leave too small spreads for the dealers to engage in intermediation. In any case, the Fed has lost its favorite policy tool. The worst budget crisis in decades is forcing states to cut funding to cash-strapped cities, which already are slashing police, firefighters and other services … In today's recession, both state and local revenues are suffering across the board. In the past 30 years, state spending has grown by an average of 6.3%. States cut a total of 0.1% from their budgets for fiscal 2009, which ends in June; the faltering economy is increasing projected deficits in the coming months. States are facing $30 billion in budget deficits for the current fiscal year, according to the Fiscal Survey of States released this week by the National Governors Association and National Association of State Budget Officers. That figure is likely to grow in the coming months. Twenty-two states, including Georgia, California and Nevada, already have cut spending from their 2009 budget. This week Minnesota's governor and legislators said cities and counties can expect aid to decrease soon. The state is coping with estimated shortfalls of $426 million for this year and $5 billion for the two-year budget period that begins in July. New York Gov. David Paterson's budget proposal, released this week, would cut about $240 million in aid to New York City. The story continues with all sorts of suggestions as to how to avoid the spending reductions. All good ideas but state & local governments are often restricted from running deficits so the best idea seems to be Federal revenue sharing as the states appear to be ready to reduce their aid to the local governments. Work week reduction (or "work sharing") has never, anywhere, eliminated involuntary unemployment and underemployment; indeed, it has never had a significant effect. That reserve army of the unemployed persisted despite reduction to the 12 hour day, the 10 hour day, and the 8 hour day. 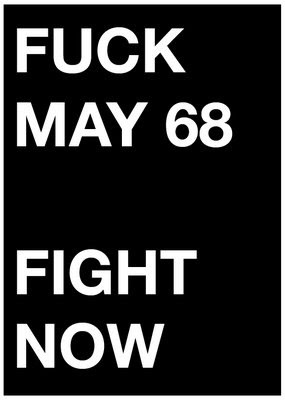 It will persist even if we can move to the 6 hour day. Work fewer hours - while workers in other wealthy countries can count on 4-6 weeks a year of vacation, workers in the United States are guaranteed no paid time off. As a result, the average work year in the United States involves almost 20 percent more hours than the work year in Western European countries. As fringe benefits a shorter work year can be more family friendly and also we can be less polluting if we take the benefits of our productivity growth in leisure instead of income. Economic stimulus is the talk of the town. Over at Talking Points Memo (and on his own blog), Robert Reich has raised the specter of "secular stagnation" -- what happens if we stimulate the economy but consumers refuse to go back to their old, pre-crisis spending ways? Dean Baker thinks secular stagnation is easy and takes a page from the Sandwichman's blog: reduce the hours of work. Sandwichman thinks "secular stagnation" is just the economists' way of being dissing cornucopia. Sandwichman engages Randall Wray in a discussion of shorter working time in which Professor Wray warns against saddling the good idea of shorter hours with "unwarranted claim that they will relieve involuntary idleness." A pretty good economic journalist, David Leonhardt, finds the happy side of falling prices. Let's look into the issue more. Very few Americans alive today can remember a time when prices across the economy were falling. But they're falling now. Note that most of the prices that are falling are "commodity" prices that are inelastically supplied and demanded (like those of gasoline, fruits, veggies, etc.) The economist Michal Kalecki (who developed a lot of Keynesian economics before Keynes) called this the "demand-determined price" sector. We should expect falling demand to hit this sector hardest. In general, significantly falling prices have not spread to the manufacturing or service sector (where prices are mostly determined by costs), with the obvious exception of autos. By the way, falling housing prices do not show up in a big way in the usual measures of the "cost of living," which only cover newly-produced goods and services. The falling house prices that Leonhardt points to are like falling stock prices in that they refer only to assets, not newly-produced items. So they don't show up in the CPI or similar measures. The cost of living measures do not assume that each person buys a house each year (or some period like that). Instead, they measure what the statisticians believe people would pay if they rented the houses. Thus, as house prices fall, that might affect the rental cost of housing and the cost of living. But actual rents did not rise as much as the asset price of housing in the late bubble, so they're not likely to fall as much either. Most workers -- who are mostly renters -- won't benefit much. In any event, falling house prices will not be a benefit to those of us who are strapped for cash due to lay-offs or stagnant income and have a really hard time borrowing. Mostly, they will hurt those who (partially) own houses, pushing them in the direction of being "upside down" (having negative equity in the house). Many have already achieved that fate. This encourages the recession by depressing consumer spending further. These [price] declines have raised fears of a deflationary spiral — fears that help explain the Federal Reserve's surprisingly large interest rate reduction on Tuesday. And there is good reason to fear deflation. Once prices start to fall, many consumers may decide to reduce their spending even more than they already have. Why buy a minivan today, after all, if it's going to be cheaper in a few months? Multiplied by millions, such decisions weaken the economy further, forcing companies to reduce prices even more. This "expectations effect" is only one reason why deflation is a bad thing. In addition, deflation raises the real value of the debts of the debtors. It's true that it also raises the real value of the assets of the creditors. But debtors are usually the bigger spenders, so the net effect is to depress demand. Further, as the debtors are squeezed, more and more of them go bankrupt. This undermines the real value of the winnings of the creditors, further depressing demand. In simple terms, if you borrowed a bunch of money last year and your money income falls now, then you discover very quickly that your interest and principal payments have not fallen, pushing you to the wall. One rule is that the more debt people and companies have accumulated in the past, the more they and the economy suffer due to deflation. We in the US have just ended a monumental debt-powered splurge, at least among consumers. So avoiding deflation is especially important. In passing, it's interesting to note that the very orthodox economist Irving Fisher developed his "debt-deflation theory of great depressions" back during the last serious deflation (the early 1930s). Somehow, the role of debt has been elided. In mechanical terms, the Fed's rate cut is actually a decision to pump more money into the economy (which will cause short-term interest rates to fall). Starting next year, the Obama administration is planning to spend hundreds of billions of dollars on public works and other programs. It should be mentioned that the Federal Reserve has just run out of interest rate ammunition to stimulate the economy. Maybe "Helicopter Ben" can do something just by printing a lot of money, but we'll see how effective that is. On the other hand, Obama's stimulus plan will not happen for months... Who knows what will happen in the meantime or how large the deficit hawks will allow the stimulus to be. All else being equal, more money sloshing around an economy causes prices to rise. In this case, it will probably keep them from falling as much as they otherwise would have. So amid all the legitimate worries about deflation, it's worth considering what may be the one silver lining in the incredibly bad run of recent economic news: The cost of living is falling. Jobs are disappearing, bonuses are shrinking and raises will be hard to come by. But the drop in prices, which isn't over yet, will make life easier on millions of people. It's possible, in fact, that the current recession will do less harm to the typical family's income than it does to many other parts of the economy. There's a lot of truth to this (Leonhardt's main point). My grandparents used to tell me about how they (who weren't hurt by the 1929 Crash or the 1929-33 Collapse) were able to get real bargains because of the deflation then, even buying luxury goods that they normally couldn't afford. But a lot of other people suffered big time. My research has found that the amount of nutrition received fell significantly. Per capita food energy per day fell about 5% between 1929 and 1933. The reason is something called the sticky-wage theory. Economists have long been puzzled by the fact that most businesses simply will not cut their workers' pay, even in a downturn. Businesses routinely lay off 10 percent of their workers to cut costs. They almost never cut pay by 10 percent across the board. The Post-Keynesian economist Paul Davidson also praises the sticky money (nominal) wage as a nominal anchor that prevents deflation. The stickiness of money wages is crucial, because without it, falling prices could start a downward wage-price spiral, with wages falling due to falling prices and prices falling due to falling wages. It's this spiral which represents true deflation, the kind of deflation that's been so destructive in the past. A merely temporary fall in prices does not have this kind of negative effect. Traditional economic theory doesn't do a good job of explaining this [wage stickiness]. During a recession, the price of hamburgers, shirts, cars and airline tickets falls. But the price of labor does not. It's sticky. "Reducing the pay of existing employees was nearly unthinkable because of the impact of worker attitudes," he wrote in his book "Why Wages Don't Fall During a Recession," summarizing the view of a typical executive he interviewed. "The advantage of layoffs over pay reduction was that they 'get the misery out the door.' "
This makes a lot of sense. I hope that orthodox economists are going to follow this lead and return to the 1930s fashion of actually talking to businesscritters and workers as a way of finding out the nature of economic behavior, to supplement the standard abstract/deductive or statistical techniques. However, it's not true that "Traditional economic theory doesn't do a good job of explaining" downwardly sticky wages. The problem instead is that the dominant schools of economists ignore a very traditional reason why workers resist or resent money-wage cuts (perhaps because of an obsession with "representative agent" models). It's a version of the prisoners' dilemma. If money wages in the manufacturing and service sectors don't fall, but the demand for products is falling, then employers will employ lay-offs because their profits will be squeezed. They will also refrain from expanding their operations (as they're doing right now). This encourages further falls in employment. Lay-offs mean that the average money wage of the entire labor force (employed and unemployed) may fall even though that of employed workers does not. Falling asset prices will also hurt those workers who own houses or other assets, discouraging consumer spending. This encourages further production cut-backs and lay-offs. A downward spiral can occur even though money wages don't fall. Wage stickiness, by the way, is likely less important in the U.S. economy than it was a generation ago. That's because of the "neoliberal policy revolution" of the 1980s and after (starting with the resistable rise of Paul Volcker to power in August 1979). This revolution has meant that more and more workers are treated as commodities. Fewer and fewer of them belong to labor unions (outside of the government sector). So it's more and more likely that nominal wages will fall during the current recession. It's just possible the neoliberal policy revolution, which aimed at returning the economy to its pre-1929 state, has brought back the deflationary disaster of the 1930s. Of course, we won't know until it happens. If the reflation efforts of the Fed and the federal government succeed, any undermining of the sticky wages phenomenon is irrelevant in practice. If the anti-government rhetoric of the neoliberals is to be taken seriously, it's ironic that its policies have put so much responsibility has been put in the Fed's and federal government's hands. Companies resort to cutting jobs and giving only meager pay increases, increases that are even smaller than the low rate of inflation that's typical during a recession. This recession may well be the worst in a generation — but thanks to the stickiness of wages, the pay drop for most families may not be much worse than that of a typical recession. The forecasting firm IHS Global Insight predicts that prices will fall by an additional 1 percent in 2009. That would bring the total drop, from the summer of 2008 to the end of 2009, to roughly 4 percent. But you can be sure that most executives will not force their workers to take a 4 percent cut in their paychecks. The fears about morale will be too great. Should we rely on this forecast? I doubt it. The accuracy of economic forecasts has dived even lower in recent years. Forecasts seem better measures of what people expect than of what might actually happen in the world. Strange as it sounds, the drop in prices will keep real incomes — inflation-adjusted incomes — from dropping too much. I don't mean to make things sound better than they are. The economy is bad and getting worse. A deflationary spiral remains a real threat, even if it's not the most likely result. No matter what, unemployment is headed much higher. People who keep their jobs, meanwhile, will suffer through some stealth pay cuts — higher health insurance premiums, for instance. Raises will also remain meager in 2010, even if prices start rising again. Like every other recent recession, this one will force families to take an effective pay cut, and a significant one. Alas, "stealth pay cuts" are not really stealthy: they hit people directly in the pocketbook, having the same effect as non-stealthy pay cuts. Higher health insurance premia reduce the amount of income left over for other purposes. And they're hard or impossible to avoid, just like a payroll tax increase. They encourage resentment -- and cut-backs in consumer spending -- just like non-stealthy pay cuts. True, but methinks that Leonhard is a tad too optimistic. Goldman Sachs Group Inc., which got $10 billion and debt guarantees from the U.S. government in October, expects to pay $14 million in taxes worldwide for 2008 compared with $6 billion in 2007. The company’s effective income tax rate dropped to 1 percent from 34.1 percent … The rate decline looks “a little extreme,” said Robert Willens, president and chief executive officer of tax and accounting advisory firm Robert Willens LLC. “I was definitely taken aback,” Willens said. “Clearly they have taken steps to ensure that a lot of their income is earned in lower-tax jurisdictions.” U.S. Representative Lloyd Doggett, a Texas Democrat who serves on the tax-writing House Ways and Means Committee, said steps by Goldman Sachs and other banks shifting income to countries with lower taxes is cause for concern. The firm is subject to examination by the U.S. Internal Revenue Service (IRS) and other taxing authorities in jurisdictions where the firm has significant business operations, such as the United Kingdom, Japan, Hong Kong, Korea and various states, such as New York. The tax years under examination vary by jurisdiction. During fiscal 2007, the IRS substantially concluded its examination of fiscal years 2003 and 2004. Tax audits that have been substantially concluded in other jurisdictions in which the firm has significant business operations include New York State’s examination of fiscal years through 2003, the United Kingdom’s review of fiscal years through 2003 and Hong Kong’s review of fiscal years through 2001. The firm does not expect that potential additional assessments from these examinations will be material to its results of operations … The effective income tax rate for the first half of 2008 was 27.7%, down from 29.5% for the first quarter of 2008 and 34.1% for fiscal year 2007. The decreases in the effective tax rate were primarily due to changes in geographic earnings mix. In other words, less taxable income has been declared in high tax areas such as the US, Japan, and the UK. I wonder if the IRS Examination will scrutinize the transfer pricing policy for this company which recently received debt guarantees from the U.S. government. The Consumer Price Index, a key inflation reading, fell 1.7% last month, according to the Labor Department. That was much weaker than October's 1% drop and exceeded the 1.3% decline forecast by a consensus of economists surveyed by Briefing.com. Prices fell by the greatest amount since the Department of Labor began publishing seasonally adjusted changes in February 1947. Though falling prices may seem like a good thing for consumers, deflation is generally bad for the economy. If prices fall below the cost it takes to produce products, businesses will likely be forced to cut production and slash payrolls. Rising unemployment would cut demand even further, sending the economy into a vicious circle. Deflation usually represents a system-wide contraction in demand, with consumers waiting on the sidelines as they wait for prices to decline even further. Economists expect more drops in consumer prices for several months, but most say deflation is still a long way off. Deflation usually represents large, sustained drops in consumer prices, but so far the economy has only recorded two consecutive declines. "It's a bit premature to say we're in a period of deflation," said Anika Khan, economist at Wachovia. "We've had two months of record declines, [and] deflation may be a far-off worry if that continues." Is it really premature to worry about deflation? Then why is the yield on inflation indexed government bonds for 5-year and 7-year maturities higher than the yield on their nominal counterparts? “Who lost the U.S. car business?” Right after the UAW vetoed a compromise, bankruptcy-lite, Detroit-little-three rescue plan put together by Tennessee Republican Bob Corker, UAW president Ron Gettelfinger played the blame game by blasting Corker and the Republican party for “singling out” union workers to shoulder the burden of reviving the U.S. car business. In truth, the UAW is to blame. If Sen. Corker’s plan had prevailed, with UAW support, many believe it would have had 90 votes in the Senate. GM could have gone forward with a clean-as-a-whistle balance sheet under a three-part restructuring plan that included a $60 billion bond-refinancing cram-down, a renegotiation of the $30 billion VEBA health-care trust, and a pay-restructuring plan that would put Detroit compensation levels in line with those of foreign transplants Honda, Toyota, Nissan, and BMW. Average compensation for the Detroit little three is $72.31. Toyota’s average wage is $47.60, Honda’s is $42.05, and Nissan’s is $41.97, for an average of $44.20. So Corker’s idea was to bring that $72 a lot closer to that $44. Kudlow should know by now that this $72 an hour compensation claim is a crock. Count this claim as mendacity. But 90 votes in the Senate for Corker’s plan – that is off the charts! As far as a clean-as-a-whistle balance sheet, doesn’t Kudlow know how to read a balance sheet with GM’s showing about $170 billion in liabilities exceeding the book value of its assets by about $60 billion. The ultimate whopper in this Kudlow canard was that Corker was trying to negotiate in good faith while the “UAW refused to make concessions”. If I were a conservative, I’d be completely embarrassed with the serial garbage that gets published under the name The National Review. Last month a special debt audit commission in Ecuador released a report charging that much of that nation's foreign debt was illegitimate or illegal. "The commission evaluated all commercial, multilateral, government-to-government and domestic debt from 1976-2006". Perhaps the most critical element of this commission's ruling is the charge that Paul Volker's decision to hike US interest rates to extraordinary and unprecedented levels in the late 1970s  constituted a "unilateral" increase in global rates that compounded Ecuador's indebtedness. How legitimate can it be for, on the one hand, political leaders to be accepting loans on terms that leave their nations economically vulnerable, and on the other for the US to have the power to 'unilaterally' and unjustly increase loan liabilities for the world's poorest (and other) nations? The long-term outcomes of such an international lending regimes have been disastrous. Since 1970 – in the period known as the ‘oil boom’ in Ecuador the official poverty level grew from 50 to 70 percent and under or unemployment increased from 15 to 70 percent. Public debt increased from $240 million to $16 billion. At the same time "Vast areas of rain forest have fallen, macaws and jaguars have all but vanished, three Ecuadorian indigenous cultures have been driven to the verge of collapse, and pristine rivers have been transformed into flaming cesspools." Ecuador's use of legitimacy as a legal argument for defaulting on their loans sets a major precedent in international finance and the global economy. "Indeed, the mere formation of a debt auditing commission does so." There is no doubting, however, that the rapidly increasing poverty and hunger along with the dire state of the world's living environment means attention to the impacts of unreasonable and unjust debt regimes is long overdue. Paul Volker was then chairman of the US Federal Reserve. 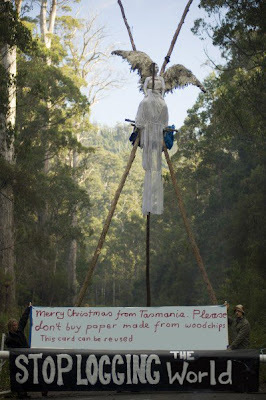 By Daniel Denvir, AlterNet. Posted November 26, 2008. California is undergoing its own shock treatment. The Republicans are a minority, but they have enough votes to block the supermajority required to pass a budget. They have all signed a no tax pledge. They have a plan to balance the budget without taxes, by drastically cutting spending and destroying environmental and labor protections, such as giving employers flexibility to demand as much work for as many hours without overtime pay on any single day, so long as the number of hours does not exceed 40. I have one small nitpick – TPMs lead was “Study: Labor Shortage Driving Immigrants Out Of the Labor Market”. Jordan was clearly describing a labor market with excess supply – not excess demand. The folks over at TPM are smart enough to know the difference so I trust they will properly adjust their lead. The report can be found here and notes that the decline in this group’s employment-population ratio was even greater as their measured unemployment rate rose. American homeowners will collectively lose more than $2 trillion in home value by the end of 2008, according to a report released Monday. The real estate Web site Zillow.com calculated that home values have dropped 8.4% year-over-year during the first three quarters of 2008, compared with the same period of 2007. Life-cycle models of consumption tend to suggest that a drop in wealth would lead to a decline in consumption. If one assumed that each $1 decline in wealth leads to a $0.05 decline in consumption, this $2 trillion estimated decline would mean a $100 billion decline in consumption. Real consumption (all figures 2000$) declined by almost $80 billion on an annualized basis last quarter. Since 2006QIV, consumption has increased by only $142.2 billion per year even though real GDP increased by $355.9 billion. Had the ratio of consumption to GDP remained at its 2006QIV level of 71.5 percent, we would be seeing an additional $112 billion in consumption demand. Maybe a rise in savings might be seen as a good thing if investment demand were also rising, but currently the fall in investment demand is so large that it is largely wiping out the progress in export demand. As private consumption declines, we will need a boost from government purchases if we are to avoid what Keynes called the paradox of thrift. Speaking of the paradox of thrift – check out this cartoon with hat tip to an Angrybear. In his "Tour of German Inflation" (in One-Way Street), Walter Benjamin singled out the expression, "things can't go on like this" as exemplifying the "stupidity and cowardice constituting the mode of life of the German bourgeois". Embedded in the expression is the unfounded conviction that, somehow or other, unpleasant conditions cannot be enduring ones. However, as Benjamin noted, "to decline is no less stable, no more surprising, than to rise." Yesterday, in the New York Times, nine economists weighed in on what, in their opinion, would constitute the ideal stimulus package, given the constraints of a $500 billion total to be either spent, returned in tax cuts or some combination of the two. Of course, the underlying premise of any stimulus package is the growthodox conviction that "things can't go on like this" -- that the accustomed "economic growth" of the recent past should be the norm and interruption of that growth can only be an anomaly. Get over it, suckers. Bernie Madoff had the economic stimulus package meme down pat. Madoff's estimated $50 billion Ponzi scheme was already 10% of the proposed $500 billion package. O.K., then, in twenty five words or less, what's the difference between a stimulus package and a Ponzi scheme (bearing in mind the operative concept, "German Inflation"; see also "Uh Oh...")? For an alternative, step back into history and consider the story of Lucas Aerospace, brilliantly chronicled by Hilary Wainwright and David Elliott in The Lucas Plan: A New Trade Unionism in the Making? Lucas made military aircraft and was facing devastating (but socially desirable) cuts in demand for their wares. Seeing the handwriting on the wall, production workers teamed up with engineers and conducted a detailed inventory of their firm’s capacity: what skills and resources they comprised. Then they canvassed a range of nonprofit organizations to find out what kinds of products served important social needs but were not being provided in the market, like improved prosthetic devices and equipment for upgrading railroad crossings. Putting two and two together, they proposed production plans to give the company a new lease on life. The final piece, however, never materialized. The social agencies needed the government to allocate funds for these new products, but the government didn’t come through, and Lucas eventually folded. You can probably see where I’m going with this. Obama is proposing to spend hundreds of billions of dollars on public projects to restart the economy, and forward-thinking observers, like Jamie Galbraith, are pointing out that we need long-term restructuring, not just a quick burst of stimulus. Who will build the transit systems, smart two-way electrical grids and other components of a clean, green America? If the auto companies are liquidated, we lose a ton of capacity it will be difficult and expensive to replace. Message to the Obama team: begin formulating the reconstruction plan as a set of receivables and be ready to energize producers from the outset, perhaps with contracts having a loan component. Message to the UAW and progressive-minded professionals in the auto industry: don’t wait for your top management to shuck the business plans they’ve staked their careers on. Begin a Lucas-like process of discovering what you can produce, and convey this directly to the federal recovery folks. This is the democrats first opportunity to payoff organized labor after the election. This is a precursor to card check and other items. Republicans should stand firm and take their first shot against organized labor, instead of taking their first blow from it. This rush to judgment is the same thing that happened with the TARP. Members did not have an opportunity to read or digest the legislation and therefore could not understand the consequences of it. We should not rush to pass this because Detroit says the sky is falling. if the White House follows through on its suggestion that it might use TARP funds to stave off bankruptcy, the GOP maneuver will have been a total disaster. Remember, the Republicans have leverage because they still have 49 Senate seats and the auto companies need their loans right away.And, indeed, Republicans have used their leverage to force wage concessions and not force the auto companies to start producing low-emissions vehicles. But if they've overplayed their hand to the point where the White House floats a loan until January, then the GOP's leverage will nearly collapse. When the new Senate and White House convene, the Democrats will cut a much better deal for themselves, with fewer or no wage cuts for workers and tougher environmental standards. In other words, their ploy may have failed and now we know their true motivations was to let millions of workers lose their jobs for raw partisan purposes. So, recently here Peter Dorman and I were commiserating over having largely called most of the current crises, only to fail to have seen the surge of the dollar as people "flew to quality," leading ultimately to the absurdity of negative yields on 90 day Treasury bills just a few days ago. A number of other commentators also have been beating themselves over the head for failing to foresee the dollar's strength (Brad DeLong and Arnold Kling, among others), although none of them were as prescient on other matters as Peter and me (ooh, ooh, such self-puffery). However, in the last two days the euro to dollar rate has gone from about 1.27 to 1.33. Does this mean that the other shoe is about to drop, and that the world is about to become fed up with the dollar and run for their lives in the face of our ongoing massive current account deficit and historically unprecedented net foreign indebtedness, not to mention so much other baloney? The Senate on Thursday night abandoned efforts to fashion a government rescue of the American automobile industry, as Senate Republicans refused to support a bill endorsed by the White House and Congressional Democrats ... So far, the Federal Reserve also has shown no willingness to step in to aid the auto industry, but Democrats have argued that it has the authority to do so and some said the central bank may have no choice but to prevent the automakers from bankruptcy proceedings that could have ruinous ripple effects … the Senate failed to win the 60 votes need to bring up the auto rescue plan for consideration. The Senate voted 52 to 35 with 10 Republicans joining 40 Democrats and 2 independents in favor ... The automakers would also have been required to cut wages and benefits to match the average hourly wage and benefits of Nissan, Toyota and Honda employees in the United States. First of all – if only 40 Democrats voted for cloture, where were the other guys? Secondly, what is it that the Federal Reserve might do to keep the Big 3 alive until we have a new Congress and White House? Finally, when Mitch McConnell says he wants the UAW to eliminate their gap between their hourly compensation and that of those US employees of the Japanese car manufacturers, does he still (mistakenly) think that their current compensation is over $70 an hour? Hilzoy suggests that the behavior of McConnell and his minions is not responsible. It is certainly true that some of their arguments against this bailout proposal have been dishonest. Grounds for invoking the provision include "the need for a restatement of results, a significant financial loss or other reputational harm to the Firm or one of its businesses," the memo said. Morgan Stanley's rule applies to 2008 bonuses and cash payouts vesting over a three-year period. The roughly 7,000 employees covered by the policy range from top brass to midlevel workers. Patterson, Scott. 2008. "Securities Firms Claw Back at Failed Bets." Wall Street Journal (10 December). For a while in the 1990s I used a quote from a book review by Canada's new Liberal leader, Michael Ignatieff, in my signature file: "Only in mediocre art does life unfold as fate." As fate would have it, 12 years later I can now Google search the phrase and come up with 70 or so of my own musings from a decade ago. I was only able to find the originl source of the quote, "The Illusion of Fate" in the February 13, 1995 New Republic, by truncating the phrase. Side-shadowing speaks to the contingent and haphazard way our lives unfold. This contingency leaves us with a haunted sense of lives that we might have lived, choices that we might have had good reason to make. Only in mediocre art does life unfold as fate. Yet all of us yearn, in Bernstein's words, for the possibility that our biography "will be revealed as destiny," and that "the life we ended up having was, from the outset, actually the only possible one." This is what makes us suckers for bad books. Earlier in his review -- commenting on the demise of the "grand narratives" of Marx, Freud, Weber, Durkheim, etc. -- Ignatieff observed that the passing of those commanding theories "leaves us in a curious state of intellectual denudation. For theories of the past are always maps of a possible future. Now we are walking backward into the future, and without maps." I wonder if Ignatieff will now, as Liberal leader, advocate a "contingent and haphazard" party program.